Here’s what’s happening in Gatlinburg and Pigeon Forge in this month of April, 2019. There’s a lot going on as always – see the full list below. And note our current Cabin Specials with deals up to HALF-PRICE. Check the Specials page for our Easter Weekend 50% off large cabins (round up the gang!) as well as our Weeknights (Sun-Thurs including Easter Sunday) “Buy 2 Get 2 Free” specials on all cabins – that’s half price on a 4-night stay! UPDATE: Now Easter Weekend, April 19-21 is HALF-PRICE on ALL available cabins. Call us anytime at 855-91-SMOKY! March 16-April 14. At Dollywod, the annual Festival of Nations is in full swing, and will continue through April 14. A visit to Dollywood is always an adventure and Festival of Nations brings a multi-cultural world of food, dance, costume and song. April 6. You can Sleep With The Sharks at Ripley’s Aquarium in Gatlinburg. This opportunity occurs a few times each year, and kids love it. If you’re 5 years old or above, you can spend the evening watching a diving show, participating in a scavenger hunt and late night activity, and then drift off to sleep while the sharks keep a watchful eye on you! April 6-7. The first full weekend of April always brings the annual Spring Smoky Mountain Trout Tournament, a fun time for fishing in the best local waters, stocked with trout. Many prizes for young and old. See our feature story for full information. April 8-10. Townsend, a few miles to the west of Gatlinburg, offers a visit to the Quiet Side of the Smoky Mountains. Close to Cades Cove, the town has unique events year round at its Heritage Center. You can see some custom jewelry on these dates, and more by different artists on April 15-18 and 19-20. Tuesdays are special too, with afternoon programs in summer. Want some expert advice on how to can food properly? On April 23 you can get some. Check the calendar for more. April 11-13. Pigeon Forge hosts the annual Spring Rod Run, when the town fills up with muscle cars and gleaming chrome in the great American sport of Cruising the Strip. It’s a friendly – and congested – street party for 3 days. April 11-13. Out in Townsend meanwhile, there’s a gathering of Ford Broncos in the largest Bronco show in the country. The Bronco Super Celebration features daily scenic drives in the mountains, food trucks, kid’s games, vendors and contest awards. April 12-13. The Wine Weekend offers a chance to sample wines from Tennessee wineries along with small dish fare from some of the best restaurants in the Smoky Mountains. 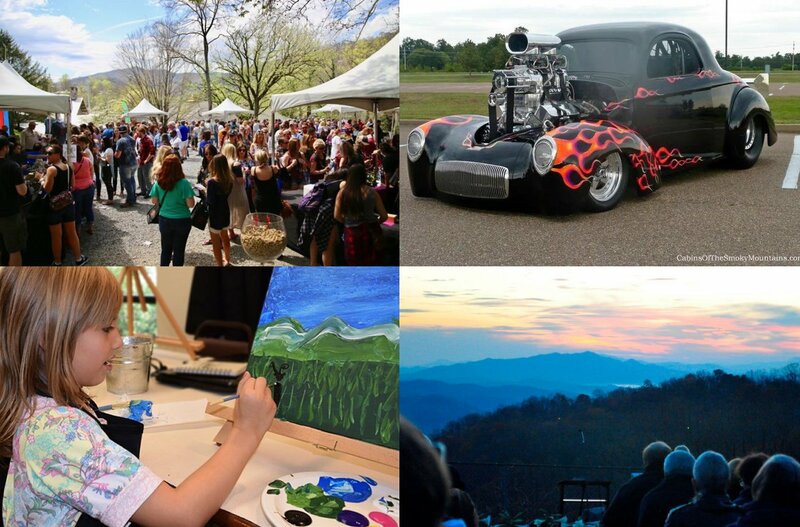 This is a popular event held on the campus of Arrowmont School of Arts and Crafts – and any reason to visit this scenic campus in Gatlinburg is worth taking, for an in-town getaway. April 12-14. Townsend hosts its annual Fiber Arts Festival at the Heritage Center, a place filled with history and local lore. Not all the artisans are in Gatlinburg: there are weavers and spinners out this way also, and this show presented by the Artisan Guild will demonstrate the “sheep to shawl” process with llamas, sheep, goats and angora rabbits. April 12-14. Meanwhile in Gatlinburg, one of the largest communities in the country of independent artisans offers a chance to visit studios and enroll in personal instruction in a number of genres. This is Hands-On Gatlinburg, a recent festival that has become extremely popular, and now offers both a Spring and Fall event. April 17-20. The Great Smoky Easter Arts and Crafts Show is a free event in Gatlinburg where many of the local artisans show their wares and demonstrate how to make them. These are always fun shows, with unique handmade items of high quality, to buy or simply peruse. April 20. Breakfast or Brunch with the Easter Bunny. Every year there’s a chance in Pigeon Forge to spend brunch with the Easter Bunny at The Old Mill Pottery House Cafe & Grille from 9:30-11:00 am. After breakfast enjoy door prizes and activities for kids. Reservations are required – call (865) 428-0771. April 20. After brunch with the Easter Bunny, step over to Patriot Park for the annual Easter Egg Hunt. Pigeon Forge hosts this free event for all kids ages 0-12, with thousands of eggs and also prizes. This usually starts at noon but get there early to be safe, and the action will be happening from 11 am on. April 21. There are many places of worship in the area, but the Easter Sunrise service at the top of the mountain at Ober Gatlinburg is one of the more unique. The Aerial Tramway offers a free round trip that morning from downtown Gatlinburg. April 24-27. The Spring Wildflower Pilgrimage annual event has been held since 1950 each year in spring. This is the short window of just a few weeks that produces a miraculous display of millions of vibrant flowers in Great Smoky Mountains National Park. The Pilgrimage ranks as the best way to explore many of the wildflower highlights. Led by experts and park rangers, the Pilgrimage draws people from all over the world to view the wildflower profusion. April 26. It’s Earth Day and Earth Week, and runners and walkers are invited to celebrate by participating in the annual Earth Day 5k Run/Walk in downtown Gatlinburg. This is a night race scheduled to start at 10:00 pm. Athletes of all ages are welcome to participate in this USATF sanctioned event. April 27. Just a few miles up the road from Pigeon Forge, at NASCAR Speedpark in Sevierville, it’s race day for walkers and runners – especially those who want to take their dog along. The Fourth Annual Color Me Mutt 5K features awards and medals in several categories, and a Pet Parade. Non-toxic fun colors are available to liven up your looks, and all proceeds go to help service dogs. April 28 – May 5. The Yellow Mustang Registry Gathering offers yet another gathering of classic vehicles, this time it’s the Ford pony. This annual event is located at The Christmas Place Inn on Parkway in Pigeon Forge. View mustangs from the 60’s to current models. Call 888-465-9644 for information. April 30. Finish off the month with some Appalachian music. Head to Townsend and the Smoky Mountain Heritage Center to hear the highly acclaimed Libby Weitnauer Perform Appalachian Music – with a jam session afterwards. Libby is both a classical violinist and a fiddle player of the more traditional sounds of Appalachia. Bring your instrument to jam after the show! It’s just another Tuesday at the Heritage Center, and the show is at 2 pm.